Greenery is an easy, plentiful addition to winter flower arrangements. In fact, greenery can move from support act to centre stage very easily in winter arrangements, with some arrangements comprising greenery and a few extra accessories. Holiday arrangements in particular benefit from the addition of greenery as these branches are so reminiscent of Christmas trees and wreaths. There are a variety of types of greenery to use in the winter, but extra precautions should be taken when decorating with greenery so that greenery doesn't become an unintended hazard. There are many different options for adding greenery to arrangements in the winter. Pine, fir, spruce, ivy, holly and mistletoe are all traditional varieties of greenery used in the UK for winter and holiday arrangements. Juniper, mountain laurel, boxwood and magnolia may not be quite as well known, or local, but can still provide great greenery as needed. Juniper in particular can look quite festive as the foliage can be silvery-blue and small blue berries often come with branches, though the needles can be quite sticky. Boxwood has a strong aroma that should be avoided for indoor arrangements. Regardless of the type of greenery you plan to use, if you are gathering leaves and branches from nature be sure not to strip the supply or you could harm the original plant and environment. Pine, fir and spruce work particularly well in indoor arrangements because they retain more moisture than other types of greenery. Holly and ivy are more delicate and look lovely in festive bouquets. These options also bring a festive scent indoors with them, so should not be used in particularly aromatic arrangements or with floral options whose aroma might clash. Plain greenery garlands can be accented with festive bows, and branches of greenery can be added to bowls of ornaments to make a centrepiece. Unfortunately, greenery can become a hazard if it is not displayed correctly. The berries found on holly, mistletoe and ivy can be toxic to people and animals and so should be kept out of reach of children and pets. Greenery must also not be displayed near heat nor fire sources (including lights and candles), nor in direct sunlight as it can be flammable. Greenery that has turned brown or needles which break rather than bend should be discarded as they are particularly dry. Greenery that is intended for display should be soaked for at least 12 hours prior to being added to an arrangement, and replaced if it begins to shed. 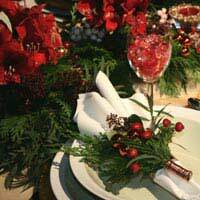 Greenery is a wonderful, traditional addition to winter floral arrangements. There are a variety of types of greenery which can be added to arrangements or used as arrangements themselves, but all should be displayed with caution to avoid any poisoning or fire hazards.